limb and people whose legs are weakening. *The device obtained CE Marking [CE 0197] for the first time as a robotic medical device. HAL for Medical Use was certified its conformity to the requirements of Medical Device Directives in EU. *CYBERDYNE Inc. received the certificate of ISO13485 (Medical Device) for the first time as a robotic medical device manufacturer. Major causes of lower limb disabilities are disorders of the cerebral and nervous muscular system. In those cases, the brain cannot use ordinary neural pathways and cannot order to move the legs. HAL for Medical Use - Lower Limb Model moves the wearer’s legs in accordance with the wearer’s intention, “I want to walk.” or “I want to stand up.”, and enables timely feedback of the feelings, “I could walk.” or “I could stand up.”. Consequently, this accelerates the learning by the brain. 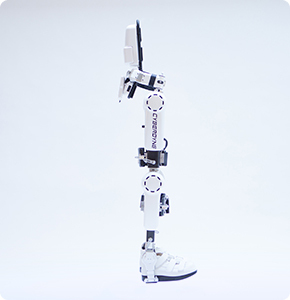 HAL for Medical Use - Lower Limb Model is the only robotic remedial device that can teach the brain how to move the legs. HAL for Medical Use - Lower Limb Model is applicable as a medical device in EU to patients of Musculoskeletal Ambulation Disability Symptom Complex [= MADS], who suffer from spinal cord injuries, traumatic brain injuries, cerebrovascular diseases, diseases of the brain and neuromuscular system, etc. 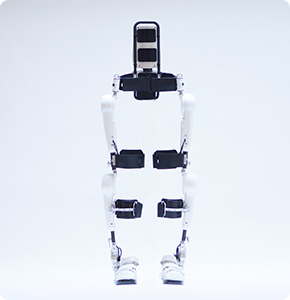 HAL for Medical Use - Lower Limb Model that sufficiently has adjustable elements to wearers’ various constitutions can fit to their leg lengths, hip widths and foot sizes in wide ranges. With its seamless adjustment mechanism, HAL can embrace the wearer’s body. When a person moves the body, various signals are sent from the brain to muscles through nerves. Those Signals leak on the skin surface as “bio-electric signals [BES]”. 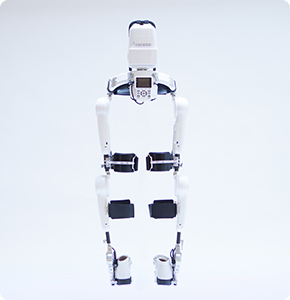 HAL for Medical Use - Lower Limb Model reads the wearer’s BES, accordingly compensates muscle power of lower limbs and assists him or her in walking, standing-up and sitting-down with his or her own legs. With the freely detachable controller of HAL, the operator can manipulate all the operations, such as start/stop of assistance, alteration of settings and confirmation of motion statuses, closely watching the move of the wearer. Tailor-made assistance for individual wearers makes training with HAL for Medical Use - Lower Limb Model more effective.